Mesquite Ginger Cookies – Yum! Everybody has their old family favorite Christmas cookies, but it is fun to add something new from time to time. Mesquite Ginger Cookies are delicious, easy to make, and relative healthy (for a cookie!). When I began to update my previous book Tumbleweed Gourmet, I eliminated many of the recipes as too out-of-date, but Mesquite Ginger Cookies survived, as great now as they were when I wrote the recipe 24 years ago. Below is the recipe as it appears in my new book Cooking the Wild Southwest, Delicious Recipes for Desert Plants. If you don’t have your own mesquite meal, you can always purchase some from the Native Seeds Search store on Campbell Ave. in Tucson or from Jeau Allen at her stalls at Tucson farmers’ markets (they both do mail order as well.) Phoenix farmers’ markets carry mesquite meal too. The recipe doesn’t call for frosting, but I couldn’t help fiddling, so I frosted some with orange butter cream and some with chocolate frosting. Yum! Preheat oven to 325 degrees F. and lightly grease cookie sheets. Grate ginger root. Beat together shortening, sugar, and egg until light and fluffy. Add honey and ginger and beat until combined. Add flours, mesquite meal, salt and baking powder and beat well. Drop by teaspoons on greased cookie sheet. Dampen the end of a clean tea towel and wrap it around the end of a juice glass. Use it to flatten each dab of cookie dough. Bake about 12 minutes until lightly browned. The cookies are soft and fragile when they come out of the oven but they firm up as they cool. Posted by Savor Blog Partners. Categories: Uncategorized. Tags: Carolyn Niethammer, cooking, desert foods, edible wild plants, mesquite, Native Seeds SEARCH, Southwest foods, wild foods. 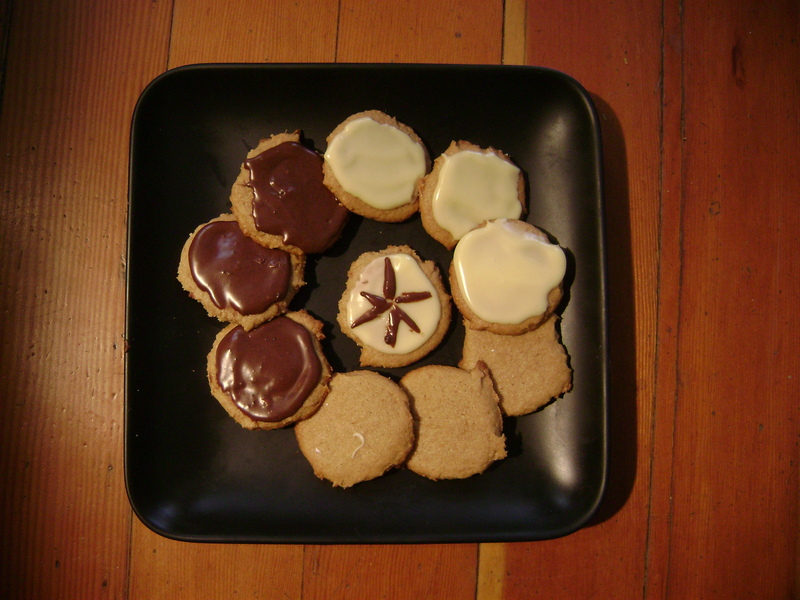 Comments Off on Mesquite Ginger Cookies – Yum!